Friends, I decided for my own sanity, I will just recap the ones I feel like recapping. Not every episode but the ones that deserves the full recap treatment. Whilst episode 8 onwards are interesting, I just don’t feel like chasing after the series and then rush to my computer to write them all. So I will just write short summaries in point form until a full recap is deserving. If you see this notice it means it is a short recap. Tuan is Malay for sir or master. Last scene the old man said something like “Tuan, sudah balik?” which means “Sir/Master, you have come home?”. In fact the old guy was speaking first in Malay and then in Hokkien and then in Cantonese whilst the coconut gangster was speaking in Mandarin I was told. I didn’t quite catch what he said. Not much to add except poor poor Sekinchan is denied its rightful recognition for that love tree house at Pantai Redang I think. Never been there. If I didn’t read the articles, I would have thought that was Penang. Seriously this geographical error which is deliberate is getting out of hand. At least, at the very least, do try to introduce its rightful place at the last brief intro scene. None whatsoever. Anyway in this episode we are told Chun Chun likes Ruco and likes durian whilst Sik Sik has a moment of OTT reaction over durian. I hate stinky tofu too but I never do that in front of someone who eats stinky tofu. Sik Sik also finds out she wronged Ruco with regards to poor Elaine now working in a nightclub as a dancer/bar girl which of course exists in Malaysia. Won’t deny that. Anyway Sik Sik did kicked poor Ruco on the leg. A lot of things ensued that involved a coconut gangster (yeah Penang very violent place on top of unhelpful, unfriendly and uncommunicative) which led to them running from Penang ALL THE WAY to Sekinchan which is in Selangor which is like 3 hours drive from Penang if you drive very very very fast. By the way Sekinchan is beautiful with paddy fields and what nots. Do visit AND it is NOT in Penang. For a series that promotes Penang as the focal point, all the beautiful places like cosmopoliton shopping place (KL), high rise buildings (KL), Indian temple/cave (Selangor), unique tree house (Selangor), paddy fields (Selangor), oil palm farms (usually along highways) and some more places ARE NOT IN PENANG! Get what I mean? Anyway, in this episode Sik Sik never bothered to say sorry to Ruco when she found out he was Elaine’s BF’s BFF who had an accident and he was helping Elaine. Not once. The script is not realistic nor is our Sik Sik a likable heroine who to me has her nose up high instead of looking down and for once saying she’s sorry. In fact in this episode she is super annoying, complains, cries, is violent and downright rude to Ruco. I can understand why she falls for him but why on earth he will fall for her? No other women? Last scene we will find out Ruco is the real “kung tzi” aka master of an oil palm farm!! WHAT? Well, next episode will explain that. Anyway a note about Aimee Chan who said she didn’t know she was pregnant when filming this series. I can see some really dangerous things she did like in this episode being pulled, pushed, ran, stumbling, etc. All quite dangerous for a pregnant woman. Unfortunately this episode annoyed me. Aimee Chan’s the reason. Her Sik Sik is just… urghhhhhh!!!! Brief scene I think by Matt Yeung who comes alive when explaining things in person, about palm oil. This episode explained a few things and is a big leap in terms of storyline except it concerns the supporting characters and is irrelevant to the main characters. In fact Sik Sik is the main character and looks more like a supporting character in here. She is just not as involved as she should be. She is kinda sidestepped and made into just an observer and an infuriating one. I know I may sound biased but I really dislike Sik Sik because she may seem like a nice girl but the way she treated Ruco was just so rude. Again no apologies except she liked him more. I hate how the guys had to earn her love but she did nothing to earn their love back. Anyway Ruco’s father owned a palm oil farm and died (Ruco doubled as the dad in the picture) and Ruco basically need not work and can still have money. He didn’t feel like running the business and left it to his loyal servant. He said these lands are not worth much and so he kept the land so workers can keep their jobs. HUH? Lands worth a lot!! Palm Oil is huge business! Small business can’t do Palm Oil! Anyway he is well off, not super rich but Sik Sik smiled more at him. No apologies for all the insults. Ughhhhhh!!!!!!!!! Also Mary Hon is not his mom! So who’s his mom he was always speaking to over the phone?! Mary Hon is actually VP for some big hotel chain and her reasons for wanting Lassie was because she used to work there, got job offer in KL and wanted to ask her lover, Sky to join her but he refused. Huge argument and parted ways and for decades could not forget him and so hated Lassie. Sky in turn wasn’t so bad. He actually wanted to train Yvonne and one time so infuriated her with talks about selling Lassie to Mary that she basically scolded him and promised everyone selling was the last thing she will do. Sky instead of being pissed off actually congratulated her and said he could finally let Yvonne take over the hotel and run things and Yvonne actually apologised to Sky. Sik Sik, hear that? Sorry? That’s an apology to someone you have wronged AND slandered! Sik Sik was surprised but never once did she expressed to Ruco that she had mistaken Sky as some potential traitor. Never. Again no sorry, no humility. Sik Sik is like Bella from Twilight. I really hate Bella. But she wanted to do the good thing, that is to reunite Mary and Sky in the end. Meanwhile Ruco cleared Elaine’s name and the one who destroyed the dress was actually Fanny the assistant manager who got fired by Sky for destroying a dress and blaming others for it AND spreading news about Sky selling the hotel to create a discord between Sky and Yvonne so in the new management she gets to be COO. Finally, some comeuppance. Chin Tsun got a big break in his career as Mary’s opinion about food is highly regarded and after some insults and Chun Chun’s encouragement, Chin Chun cooked something Mary loved. By the way do check out the scene at the oil palm farm where Sik Sik aka Aimee ate some durian soup and was so shocked poured the soup on her lap (wearing her trademark short shorts) and see what Ruco did!! He wiped them, quickly but on her upper thighs!! To Aimee’s credit, she did not flinch. Brief intro scene is by Tony Hung about Penang bridge. No comment on performance. Writing wise, Sik Sik is not getting the development she should be getting. A series about her and her love story is seriously undermining the character when the actual story is anything BUT her. There is no humility in her. That just can’t be assumed. It would be a great connective story if there is a simple scene of Sik Sik saying sorry or saying something positive about Sky in a regretful way, that Sky was really a nice guy and misunderstood. It was Vivien Yeo who impresses me with her ladylike Yvonne forced to make a stand and made it well. Aimee meanwhile fared much better as someone who does the scolding, but not as Sik Sik. She is just not right for Sik Sik but she would be right for an older, more mature, not some cheerful bad luck happy go lucky girl but a practical woman sort of character. I notice the series is supposed to focus on her but somehow, when she was standing there at the background, she wasn’t prominent. Charisma is the reason. I’m enjoying this drama more than i had initially dared to anticipate. Eps 8 and 9 really picked up the pace and shed a little bit more light on the background of Luk Kung Zi yet still leaves us curious for more as he’s one character who’s obviously not quite what he seems to be. The funniest moment in this episode has to be seeing Ruco doubling up as his late dad; Aimee saying that he’s a dead ringer for his dad was just too hilarious (along with the earlier scene where she imagined her rescuer to look like Moses), so this drama has its share of cheeky moments which i find rather charming. Couldn’t have agreed more regarding Aimee Chan! She is more of a supporting character calibre, definitely not a leading lady. You like to use a lots of (Anyway)?? Doesn’t sound professional!! Majority are your personal opinions!! I hope Jaynestar find a better candidate !! I don’t like Aimee acting too but attracking her about being pregnant and doing dangours things !! I think if she knew b4 she ‘ll at least wont do the action scence. Lizzy, stop being s troll. Seriously? Am I reading this right? You should thanks me for my harsh feedback or ignore it! But instead you chose to attack me ?? Your very unprofessional !!! Lucy, Lizzy, whatever you choose to call yourself at this moment, re read your own comment and tell me, when you put it that way, aren’t you inviting what you call “harsh feedback”? And please using the word professional. I am not doing this for a living. Out as in airing? Yes it is. Producer Fong Chun Chiu does not have a good eye in casting at all. Having Jason Chan as the lead in his debut effort -“Missing You” was a grave mistake and he committed the same blunder by giving the meaty role of Sik Sik to incompetent Aimee in “Outbound love!” Not to mention, all the boo boo pointed out here and in tvb fb page. Denise Camelia’s malay made me cringed big time! Why can’t they speak in Hokkien or Mandarin dialect? I so wanna say i am proud and thankful to TVB for shooting this drama in Penang/Malaysia but I just can’t. At least, “Born Rich” had a more engaging storyline and stronger cast. Outbound Love has flimsy plot and shallow acting from the female lead who occupies almost 70% of the screen time. This drama is not just “leceh” but “geli”(gross), too! The only pleasant suprise is that Tony Hung displayed good potential (so much better than jason). I personally liked Jason’s acting in Missing You. Me too and even my mom says that Jason’s acting is not bad and does not understand why everyone says his acting is bad. It’s the way he speaks and that perpetual smirk on his face which is really annoying. In ep 8 Aimee kicked Ruco and said: ‘I give you a lesson on behalf of women around the world.’ Isn’t that funny becos Ruco steals the hearts of so many women in reality? In ep 9, I notice Ruco’s playing magic with the diamond ring of Fanny. It disappeared in a second between his fingers. That must have hurt, poor ruco. He’s going to get kicked a few more times in the coming episodes, ouch! Would you guys recommend this series? There’s no right or wrong answer here. Just because some people doesn’t like the drama, it doesn’t mean that there won’t be people who likes it. You should give it a try anyways. ITA with you, one man’s meat is another man’s poison. I never take reviews or recommendations seriously anyway. I know that but when you hear about a series being generally good, it at times is. But at times when you say a series is bad then it ends up being good. I guess we just need to watch for ourselves to find out. However, I do not feel it is wrong to ask for an opinion from other viewers. There is much controversy regarding the inaccuracies of Outbound Love, which I hv to admit is true indeed. Though there is nothing much to shout about re it’s storyline but the bright spot is ..it is promoting Msia especially when 2014 is Visit Malaysia Year….Kudos to TVB for highlighting some scenic spots in Msia. For those who are intrigued & curious about Msian (chinese) ppl after watching Outbound Love, here’s a lengthy dejavu (as provided initially by other readers eg. anneyen) Msian Chinese are divided into 2 groups….Chinese medium & Malay medium. ( I belong to the latter…meaning I can’t read, write in Chinese but not necessarily can’t speak mandarin). Those from the English/ Malay medium will most likely converse frequently in English & some Chinese dialects while those from Chinese medium will converse (mostly) in mandarin & Chinese dialects..though….both will tend to apply Malay or English in conversing with other races, eg. Malays & Indians. Most Malaysian Chinese are multi lingual….for eg. in my household …my mom speak to my sons in mandarin, myself & wife to kids primarily in English, myself to mom in hokkien, my wife to my mom in Cantonese, myself to my wife in English, Cantonese & hakka, myself to my in-laws in hakka, myself to my siblings in hokkien & use mandarin conversing with my nephews/nieces….but, ironically we use Malay when we are in, say, China cos we don’t want ‘the other’ Chinese to know what we discuss on certain issues …some may be deemed politically sensitive & some benign bargaining matters. It’s is not surprising that some ppl may have mistaken us for HongKongers, Sporeans or Indonesian Chinese . Many have carved a name for themselves ….some have long linkages to Msia though they may not call this place their home anymore …. Thanks for the long list of Malaysian celebs and public figures. I did not know that Fung Bo Bo is from Malaysia. Others to add to the list is Christopher Lee(Fann Wong’s husband),Phylis Quek(I think that is how you spell her name, a former actress that acted for Singaporean companies), and Florance Tan(former actress). If I am not mistaken Christopher Lee is from Malacca. A lot of actors went to Singapore to pursue a tv career. Some china actors and taiwanese actors too. Yup and you know why? Cos only Mediocrecorp (Mediacorp) will take in these mediocre actors/actresses for their equally mediocre dramas. Same goes for those HK actors in Singapore as well. 3rd rate goes there become leading actors. I would not say everyone that acts for Singapore is bad or mediocre. Steve Ma Jing Tao who is a leading actor in Taiwan acted for Singapore. Jessica Hsuen who is a leading HK actress acted for Singapore too. @HTS I’m not talking abt those who act in one or two dramas but the contracted ones. Even the contracted ones do not have such bad acting, but acting is subjective so you may think that they are bad does not mean that they are. Of course it’s subjective, can’t argue with that. To me they’re all mediocre. The HK actors who have acted in Singapore dramas recently include Jessica Hsuan, Louise Lee and Ha Yu, who aren’t exactly mediocre or third-rate. MediaCorp’s working hours are more stable and less crazy than TVB’s, so maybe these HK actors find it an attractive destination to accept a project here once in a while. If you dig further back the list also includes people like Alex Man, Eddie Kwan, Michelle Yim, Nnadia Chan and Michael Tao too. You are right that many of the ones on your list were mistaken for being Taiwanese, Hk, Singapore,etc.. I used to think Fish Leong, Micheal Wong and others were all from Taiwan since they are so popular there. I also thought that Christopher Lee was from Singapore but others were telling me that they were all from Malaysia. I was surprised since I did not know that so many talented celebs hailed from Malaysia. Wow, u know Christopher Lee? I left that one out & another prominent one (which just crossed my mind a minute ago) that is Zang Toi – a New York famed fashion designer, who hail from Kota Bahru, Kelantan state (local lingo: hokkien). Yea,I used to watch some series with Christopher in it but they were all Singaporean series which was why I thought he was Singaporean. But then a fan of his told me he was from Malaysia. Ruco has some Malay blood. His grandfather was brought up in Malaysia. Source from TVB Weekly issue 864. Confused. Malay as in Chinese Malaysian or Malay Malaysian? I notice a lot of people have relatives from Malaysia. We have gone global! Since Ruco has relatives here, COME HERE MORE OFTEN!! Is that why Ruco can speak dome Malay? Thanks for the info on Ruco. I did not know he had Malaysian blood. I wonder if that is why they chose him to act in this series? hi funn … did read about what @sunflower mentioned in the forum … dunno whether it is true, someone also mention in the forum that his grandmother (mother’s mother) is malaysian and hokkien chinese from penang married to hong kong. Am curious how his mom looks like. If you didn’t tell me that’s his mom, I would have thought she is some stern looking producer. Very stern looking woman! Any pictures of his dad? Thanks for the photo. Oh so that is his mom? He looks a bit like get. I wonder how jus dad looks? Meant to say his dad. I personally think that with a drama like this with inaccuracies, people have 2 choices..
1. As a viewer, you do not let the inaccuracies to mask/overcome the drama.. The first group of people is that even though there are errors, they continue to watch the drama and try to enjoy it. 2. You let the inaccuracies “mask/overcome” the storyline or drama. For some people, they would nitpick the smallest details and let that affect their view. But by letting the inaccuracies get in the way, you may not see the beauty and might miss the whole point of this drama. A fictional TV show is usually fictional characters based on real time/events/places unless it is a fantasy film. So if it is not LOTR sort of fantasy film or a real world in fantasy world like Harry Potter, then some integrity to accuracies must be adhered to if not it is just rubbish. If it is an all out comedy, perhaps you can say it is comedic in element hence not to be taken seriously like how Zoolander depicted Malaysia. But this series is neither fantasy nor comedy. So it doesn’t hurt to be accurate or as accurate as can be. If not why bother speaking Malay, getting the durians right, etc etc? Just say stinky tofu. Some viewers have standard and expectations, which isn’t that much to begin with. By being so lax in details in a real place that you are promoting, it is just insulting the viewers. You’re right; by nitpicking maybe you will miss the beauty and whole point of the drama. Perhaps. But if no one nitpicks, no one will bother with research. Why portray anything accurately? Just write anything, memorise the script and speak the lines. It is because we nitpick which isn’t nitpicking because the core of the story is problematic, by not ignoring the blatant inccuracies we are saying to TVB we expected more from you which means we have a standard for them. By not having standard means we have given up. TVB can close shop. There can be no beauty in lazy writing and lazy storytelling and bad casting and terrible performances. 2 years down the road no one will remember this series. What TVB lacks these days are just that; memorable series. There are none. As for Titanic, the inccuracies were something the director missed. In fact the director went to great lengths to recreate the accurate scenes, and the feel of the era. Inccuracies were sometimes where the sun sets (which he set out to correct that at great cost), certain portrayals of certain characters which family dispute, etc etc but the sinking itself many experts said were accurate. So Titanic is not a good example. If it was TVB which produced Titanic, I am afraid it will be called “Boat”. By the way, on the English wikipedia page of Outbound Love, this is considered to be a romantic comedy . On the Chinese wikipedia page, it says 時裝愛情. And whether that drama is memorable or not, whether it is bad casting, bad writing, terrible performance, it depends on the viewer itself. It is very subjective. One person can love the drama but another person could hate it..
And maybe Titanic was a bad example to you, but for me, it is a suitable example because the point was although Titanic was based on real events, there are some stuff which was portrayed wrong or some details were omitted. Although they have “errors”, people still love these movies and consider them to be family favourites, or something among these lines. Hence, it’s a historical fiction movie, not a documentary. Same with Sound of Music. As for outbound love, it’s also a fictional tv drama, not a travel show documentary (which means that it doesn’t necessarily to be 100% accurate).. I would classify OL to be a Realistic fiction drama ( is a narrative in which there are events that are not true). i guess some Malaysian viewers are indignant about the inaccuracies in the drama such as geographical gaffes (one min in Penang, the next min in KL) and the lingo used (such as “Nonya” spoken the HK way rather than the way Malaysians actually say it)but for the rest of us, it doesn’t matter. As long as the drama manages to sustain our interest, we’ll continue to watch, inaccuracies notwithstanding. What if the drama had zero inaccuracies (all accurate depictions) but the storyline is crappy? Will people still consider it to be a good drama? People will still complain regardless. My gosh u really write review on every episode!!! Is it only on Ruco’s drama or because it’s filmed in KL? I don’t think u did every episode on other dramas. You should see my 3 Kingdoms RPG. Every episode. Lol I didn’t watch that either. I’m sure there will be a drama that we will watch together in the future. Then I can see how accurate your review is. So far no drama interest me at all. I think TVB make us Malaysian Chinese look like a weird ppl. We Malaysian Chinese don’t use malay speaking among chinese people, we either speak mandarin or cantonese depends on which area of Malaysia you are. Normally northern Malaysian will speak Hokkien, central of Malaysia will speak cantonese and southern will speak mandarin. Its so much depends you on which part of Malaysia and most of the Malaysian Chinese can speak Mandarin or Canto.. We normally speak Mandarin, Hokkien, Cantonese and Hakka.. We seldom speak Malay among Chinese, come on lah TVB, pls do some of your homeworks.. So when do you speak Malay? It would be sad if you call yourself Malaysian Chinese but yet cannot speak Malay at all. @HTS, perhaps KL_Guy did not elaborate further ….i honestly believe he WILL converse in Malay with other races eg. Malays, Indians, punjabis & banglas (the newly minted citizen of Msia) & what he says is true….we don’t speak to another Chinese in Malay (or bahasa as we call it here). It would be odd indeed. Note that kl_guy74 didn’t say anything about not being able to speak the Malay language.We know the language but we don’t converse in it all the time. We only speak Malay when we have to. Most if not everyone speaks English in Malaysia. Whether Chinese, Indian, Malay, Dayaks from Sabah/Sarawak, most of the time we communicate in English. A lot of older generations may not speak Malay or English. Does not make them any less Malaysian. Being Malaysian is not defined by the ability to speak Malay. It is where we are born. At school we speak Malay, out of school, we may speak less but we may be able to speak broken Malay. Even Malay have different dialects according to the states. There is a huge issue about what makes a Malaysian and this is a sensitive territory, at least to me. Nationality defines my state, not my ability to converse in certain languages. However I do believe almost all knows at least broken Malay like we know broken English. HTS, I think Ross and others had explain to you and so sorry to confuse you. We all Malaysian can speak Malay, might not speak well but still is a basic communication for us to communicate with other races such as Malay, Indian, Punjabi, Sikh, Kadazan, Iban and lately Bangla. HTS, disini saya ingin meminta maaf dengan anda (Overhere I would like to apologise to you in Malay or Bahasa). Thanks for the info and explanation. I do not know any Malaysians in real life and gave not been to Malaysia before so not sure what everyone speaks there. Thanks for explaining to me and you do not need to apologize at all. I was just confused about whether you guys can speak Malay since you guys were saying that you usually Chinese or English. I also thought that being Malaysian that you should know the language well unless you are from the older generation. For example, I consider myself American and of course can speak English and read and write in it. But my mom for example hardly knows any since she was already grown up when we came to the US. Ok, I get it Funn. Just because we are a certain nationality does not mean we need to know the language well. There is an issue about what makes a person Malaysian? I never knew that. Is it hard to get Malaysian citizenship? Yes if you’re not of certain colour or religion, sadly. I think America does not have an official language? like the policy in Japan. I heard it is really hard to get Japanese citizenship and they will not grant it to you even if you are born there. Of course America has an official language. It is English and I guess Spanish is quickly becoming the second official one due to the large number of Spanish speaking immigrants coming to the US. Meant to say Do you have Malaysian citizenship? I read on wikipedia, that US doesn’t have an “official language” at its federal level. It says that English is its National language. I find it so weird. I always thought English was the official language for USA.. I mean national language. I remember reading America can’t have a national language so as not to prejudice the other languages. But unofficially it is English of course. Yes I have Malaysian citizenship. I will be damn if I don’t for the fact that I was born to Malaysian parents in Malaysia. It is my constitutional right. I also thought that English is the official language for the US. I still think it is but others may not think so. I thought you did not have Malaysian citizenship since you claimed it was hard to get Funn. PLEASE ANSWER!!! IN EPISODE 8, Y THE HELL DID RUCO NOT BRING AMY TO HIS HOME SINCE THEY MISSED THE BUS. INSTEAD THEY SLEPT IN THE PARK AND WENT HOME IN THE MORNING, IS ABSURD, MAKES NO SENSE AT ALL, STUPID. They slept at the beach with the treehouse because it was night and neither wanted to be lost in the highway. again assuming in the morning they walked some more and reached his home where they then got transport. It is not absurb since who would want to walk out in the open at the highway in the night whilst still being chased by coconut gangster? They were sorta hiding. And more importantly, more romantic that way. If not how to show the girl depended on him, he liked her, she looked at him in the morning, seeing the sun she got excited and he felt happy seeing her excited, etc etc etc? What is absurb is them walking from Penang ALL THE WAY to Sekinchan which is in Selangor which is at least 3 hours away. Point noted but to us non Malaysian viewers, we do not know Penang from Sekinchan so it doesn’t bother us. This being TVB drama, just live and let live, don’t have high expectations. Even Hollywood movies are full of gaffes what more TVB. Which is very important that should be made clear. The fact you didn’t know nor care, this series has failed. It is supposed to be released in conjunction with Visit Malaysia Year. You may not care, but many do, Malaysians or otherwise. Hollywood never said they were promoting somewhere. This series did. I am disappointed by this sort of reaction. I would be very much interested to know if this is about HK and China with such geographical gaffes. I will find that interesting, will google to find out more on interesting places presented by a series and will be sorely disappointed at the lack of respect for that place they’re supposedly promoting. well, it certainly didn’t affect my decision whether to visit Malaysia or not. I’m not as certain as you that that many people (other than maybe Malaysians) care either. Most will probably just watch the drama for an hour’s entertainment every night, taking in the scenery but wld not really be so interested in its geography as to bother that Penang and Sekinchan are 3 hours apart or 30 minutes apart. Not everyone wants to work their brain that hard for what is essentially mindless entertainment from the idiot box, working the whole day is taxin enough for the brain, so time to get a break. If people are truly interested after watching the drama, they will visit Malaysia, geographical gaffes or not. So i wouldn’t say that this drama fails to promote Malaysian tourism. also in facebook, astro posted something about “is it possible to climb batu caves in 2 minutes” … and the malaysian viewers posted comments like travelling between kl and penang within minutes is possible … so anything is possible. btw, i remember watching a Hollywood movie where one character was digging the ground and ended up in China ! (can’t remember the title), that took the cake for being most ridiculous! I personally don’t think this series is making me want to go to Malaysia. Sorry. I tend to hate the hot and humid weather. I think many will be offended by this statement. I give more credit to the viewers as I feel they will be interested to know the wheres and hows in Malaysia rather than those like you who doesn’t care and watches a show with your mind shut off. 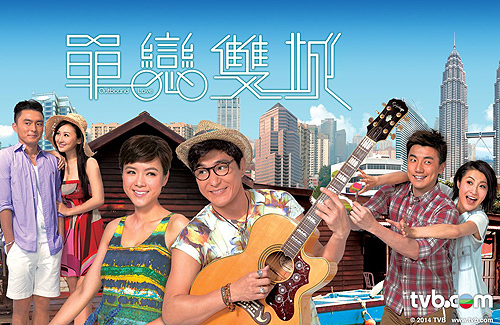 There are those who are inspired by tv series from TVB no less to be in certain career. So I wouldn’t call it mindless entertainment. To some some shows have a significant impact on their lives, whether I agree or not is a different matter. Please respect these group of viewers. Anneyen, my point exactly. At least the sarcasm is funny and well deserved for TVB! But 2 minutes for Batu Caves may be possible for those super fit? It is because it is released during 2014, the visit malaysia year. ASTRO is malaysian company. How much clearer should the intention be? Maybe not Visit Malaysia but definitely Visit Penang because the main point in the series is Penang and the pretend places as well. I’m aware of that, thank you very much. What I am saying is that this drama is not successful at promoting the “VISIT MALAYSIA” because this drama ISN’T making ME wanting to visit Malaysia at all. Funn, what i said about mindless entertainment and idiot box was not meant to be offensive as you made it seem to be. “Idiot box” is the term people commonly use to refer to tv as btw, it’s not something made up by me to offend. Lighten up, no need to be so serious about a mere TV drama, though the patriotism in you wants to scream everytime a gaffe about Malaysia is made. I asked my mom if she heard of 2014 as “visit Malaysia” year since she works in a travel agency, my mom says no. It seems that this whole “visit malaysia” is not very wellknown in Canada. Most people,.especially people in Vancouver are associating 2014 with the upcoming Winter Olympics.. It is Visit Malaysia year for 2014. However I am afraid Malaysia isn’t that well known in the world. uggg, maybe i’m jumping the gun by commenting abt ep 10 but seriously where did TVB get those 2 Malaysian actors playing the old couple from? They can act for sheet and just make me cringe worse than Aimee many times over. Never seen worse acting and they aren’t even as old as they’re supposed to be. The make up was terrible, most unconvincing. At least get 2 real old people for the role for gawd’s sake! Too much of this annoying “old” couple that it slowed down an otherwise enjoyable episode. Funn, do you have the link to that BTS you mentioned about Ruco running up the steps of Batu Caves? Wld love to se it, thx in advance.